Than Zaw Aung, lawyer for Reuters journalists Wa Lone and Kyaw Soe Oo, talks to journalists after their trial, Feb. 1, 2018, outside Yangon, Myanmar. 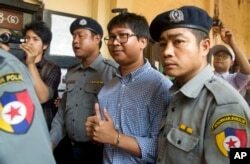 Two Reuters journalists arrested in Myanmar for violating the country's colonial-era Official Secrets Act were denied bail during a court appearance Thursday. Wa Lone, 31, and Kyaw Soe Oo, 27, were arrested on December 12 after they were handed a stack of documents by two policemen at a restaurant in Yangon. The pair were covering the brutal military campaign in Rakhine state that has driven nearly 700,000 Rohingya Muslims across the border into Bangladesh since August. The two journalists face 14 years in prison if they are convicted under the law, which dates back to 1923 when Myanmar was known as Burma and ruled by Britain. Stephen J. Adler, Reuters president and editor-in-chief, issued a statement expressing his disappointment over the pair's continued imprisonment. "We believe the court proceedings will demonstrate their innocence and Wa Lone and Kyaw Soe Oo will be able to return to their jobs reporting on events in Myanmar," Adler wrote. "We continue to call for their prompt release." Reuters journalist Wa Lone, center, is escorted by police as he returns to court after a break during their trial, Feb. 1, 2018, outside of Yangon, Myanmar. In New York, a spokesperson for U.N. Secretary-General Antonio Guterres said he is closely watching developments in the case. "The Secretary-General has expressed his concern at the erosion of press freedom in Myanmar and he has called for the international community to do what it can to secure release of the journalists and ensure press freedom in the country," spokesman Stephane Dujarric said. Former U.S. ambassador to the United Nations Bill Richardson recently resigned from an international advisory commission on the Rohingya situation over his disappointment in Myanmar's de facto leader Aung San Suu Kyi's inaction. He told VOA contributor Greta Van Susteren that he raised the issue of the two Reuters journalists and mass graves they had discovered in Rakhine state in a meeting with Aung San Suu Kyi, the 1991 Nobel Peace Prize laureate. "She literally exploded, interrupting me, telling me that 'This is not your charter, Bill. This is out of the question. Stay out of those issues,'" Richardson said of their conversation. Separately, the Associated Press reported Thursday it had gathered evidence from Rohingya refugees of at least five mass graves in Rakhine state, and believes there may be many more. The report is based on interviews with more than two dozen survivors in refugee camps across the border in Bangladesh and from time-stamped cellphone videos. "This type of information coming forward from Rakhine state just underscores the need for the U.N. to have access to Rakine state," Guterres' spokesman said. "We do not have the access we would like to have, and it is very important for us to have access to verify these reports," he added. State Department spokeswoman Heather Nauert said the United States found the report of new mass graves "deeply troubling" and added that the new report "highlights the ongoing and the urgent need for Burmese authorities and investigators to cooperate with an independent, credible investigation into allegations of atrocities in northern Rakhine state." "With the help of forensic experts, an investigation would provide a more comprehensive picture of exactly what happened. The world needs to know exactly what happened there," Nauert added. Meanwhile, Aung San Suu Kyi's spokesperson said a gasoline-filled bomb was thrown at the leader's lakeside home Thursday in Yangon. She was not in the house when the incident happened and there was little damage, Zaw Htay said. The residence is where Aung San Suu Kyi spent much of her two decades of detention under Myanmar's former military junta, a long period that garnered her worldwide acclaim as a symbol of democracy and eventually the Nobel Peace Prize. But what is widely seen as a tepid response to the ongoing humanitarian crisis involving the ethnic Rohingya Muslims has damaged her international reputation.